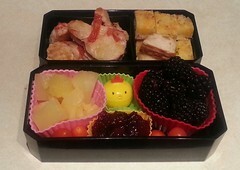 We had pizza last night and as usual I ordered more that we could actually eat, so we have left overs in today’s Bento. Upper berth: Double Cheese and Tomato pizza (note how the tomato slice looks like a head wound) cut into bunny and heart shapes. Lower berth: Pineapple, Blackberries and Cranberry Sauce surrounded by Grape Tomatoes. Chickie holds the meds. ← Dang, lost my spot.